Come out the west exit of the station. Go to bus stop number 8. To get to the bus stop, go straight down the street that connects Tobu Department Store and O-dori. The bus stop is on the corner of O-dori,in front of JTB (a travel agent). From both places, catch the bus ＃５２，heading for San-no danchi ( 山王団地 ) or ＃５６，heading for Imaichi shako（今市車庫）. Get off at the Nozawadera mae（野沢寺前） stop. 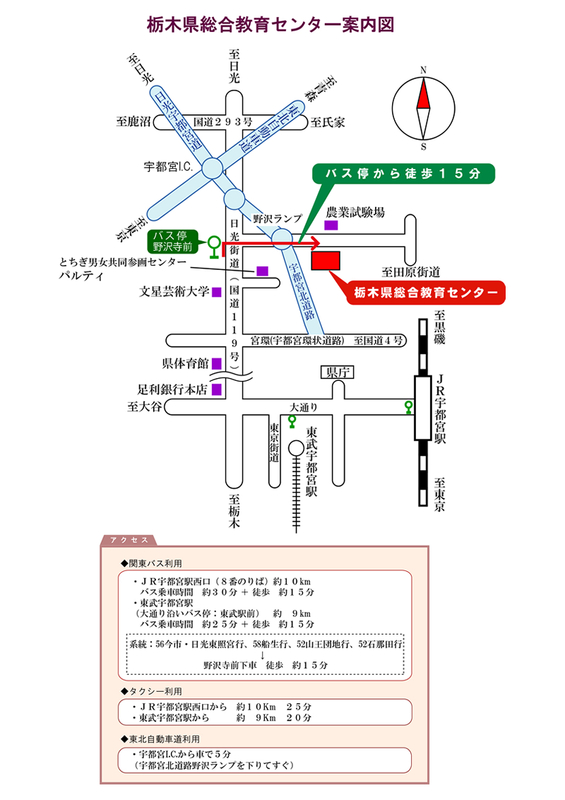 It takes about 30minutes from JR Utsunomiya Station to Nozawadeara mae stop. And It takes 15minutes to walk from the bus stop to Tochigi Prefectural Education Center. Go straight down the street toward the North and turn right at the second signal, Nogyoshikenjyo iriguchi（農業試験場入口）. Keep going about 800meters. Tochigi Prefectural Education Center is on your right. A one-way fare is 470 yen. When you get on a bus at Nozawadera mae, please don't forget to take a ticket (seiri-ken). If you forget to take it, you have to pay more money. Nozawadera mae TOBU Utsunomiya St. JR Utsunomiya St. Copyright(c) 栃木県総合教育センター All Rights Reserved.